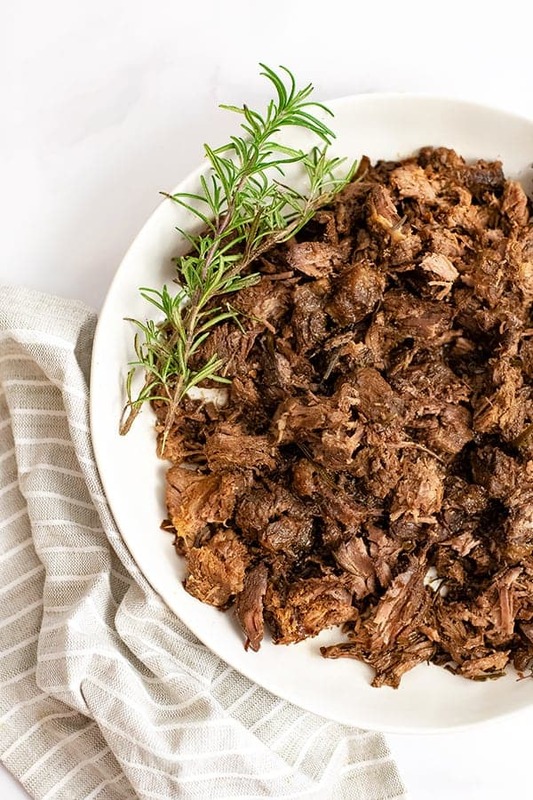 Slow cooker balsamic beef is going to become one of your family favorite recipes for busy weeknights! Made with just a few ingredients, this slow cooker recipe cooks all day and is equally delicious as leftovers the next day! Paleo, Whole30, gluten free and so simple to make! Growing up, my mom made us a roast at least once or twice a month, and I always remember getting so excited to have that (and mashed potatoes) for dinner! I remember how good the house smelled and we always had leftovers for days! 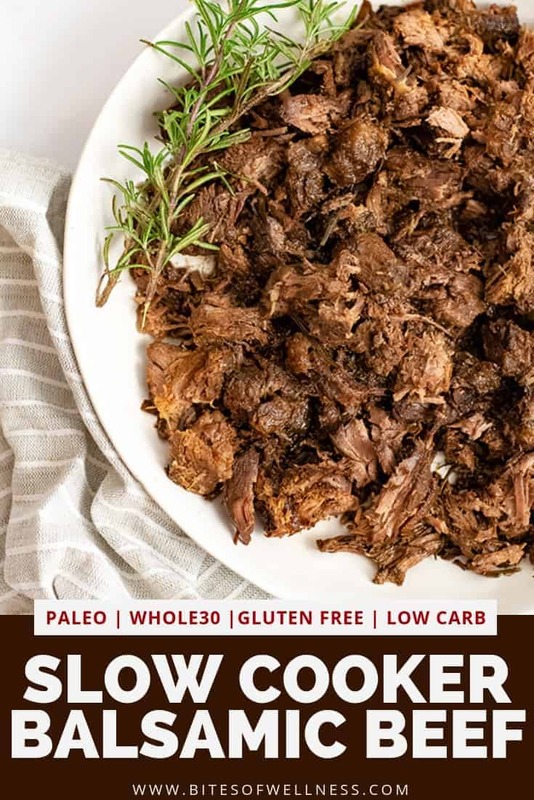 Since I usually only cook meat for Dave, I often stick to things like Instant Pot Beef Stew or slow cooker shredded chicken, since I like for the meat to easily be made into multiple meals or really good as leftovers! I’m not sure why it took me so long to make roast beef in the slow cooker, but I will be adding this to the rotation for sure! Dave was super excited to have it for 3-4 meals in a row (which normally doesn’t happen) and has already requested me to make it again! Luckily this slow cooker balsamic roast beef doesn’t take very much effort and I usually have all the ingredients on hand! I made this recipe with stew beef (usually beef chuck or round that has been cut into cubes) but you could also use boneless roast beef (chuck or round roast) if you can find that at a better price at your grocery store! 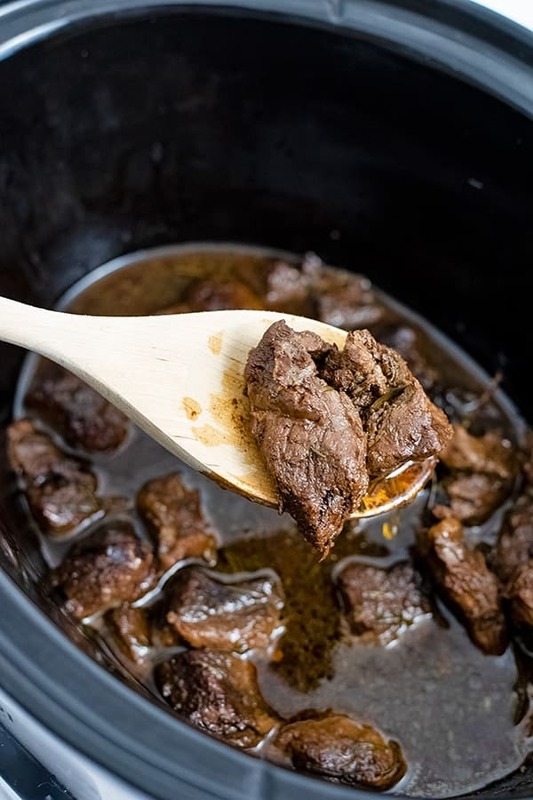 This recipe uses balsamic vinegar to flavor the beef, and after the balsamic cooks for 8-10 hours, it really mellows out and sweetens up a little bit. 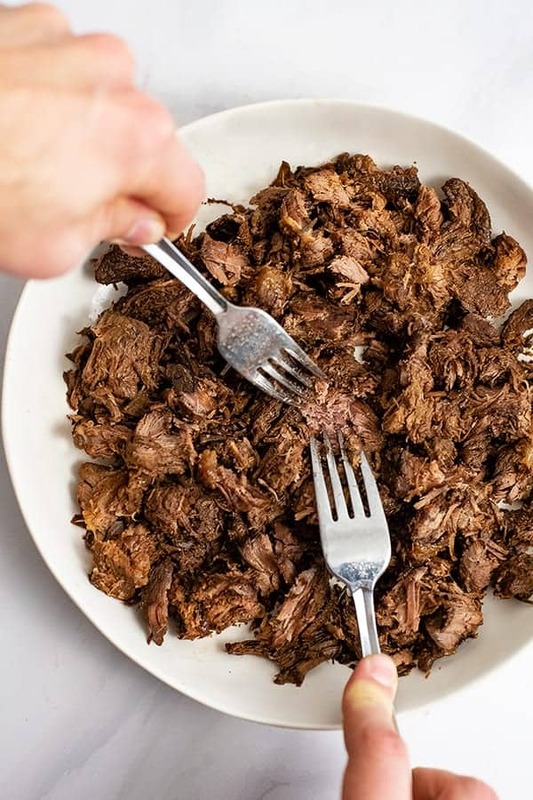 Don’t worry; this slow cooker balsamic beef does not at all taste acidic! The leftover juices from roasting can easily be made into a simple gravy in just 5 minutes, so be sure not to let them go to waste! Once the beef is done cooking, remove it from the slow cooker, reserving all the liquid. Bring the reserved liquid to a simmer over medium heat. Add 1 tbsp arrowroot flour or tapioca flour and 1 tbsp water together in a small bowl, mixing well to fully dissolve the flour. Add the arrowroot flour slurry to the simmering liquids. Stir well. This will thicken within a minute or two. Remove from heat when reaches desired consistency. This gravy will continue to thicken on the heat. Add the stew beef or roast beef to a double ziplock bag or freezer safe container. Mix together the rest of the ingredients and pour over the beef. Squeeze out all of the air, date the package and place in the freezer (up to 3 months). Cook in the crockpot on low 8-10 hours. After cooking, if you have leftovers that you want to freeze, package them in individual portions in small containers or ziplock bags. Remove as much air as you can and be sure to date the packages. Can be frozen for up to 3 months. 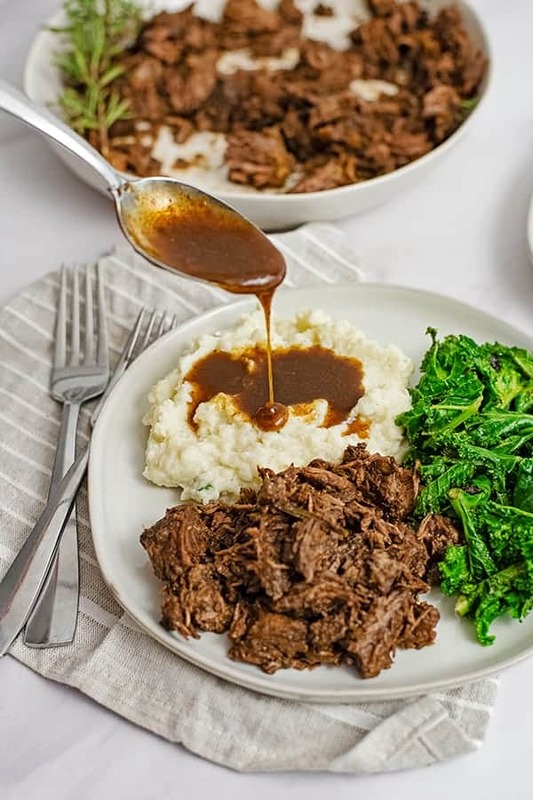 Make sure to watch this video to see how quickly this Slow Cooker Balsamic Beef is. Let me know if you have any questions in the comments below! 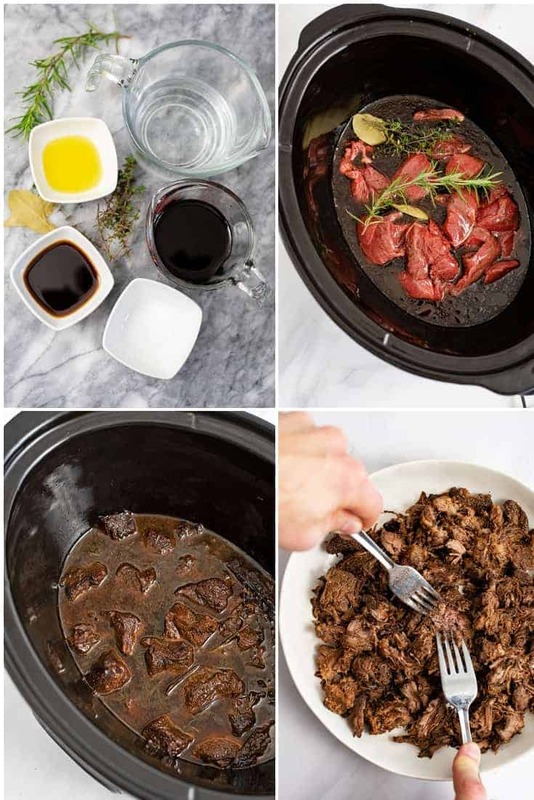 This slow cooker balsamic beef recipe is the easiest weeknight meal! So easy to make and the whole family will love it! Gluten free, paleo, Whole30 and low carb, this simple recipe is perfect comfort food! MIx together the balsamic vinegar, water, coconut aminos, garlic olive oil (or garlic powder) and salt in a bowl. Bring the liquid to a simmer over medium low heat. In a small bowl, combine 1 tbsp arrowroot (or tapicoa) and 1 tbsp of water until the flour is completely dissolved. Pour the arrowroot and water mixture into the simmering pot with the leftovers from the roast. Stir well. After 1-2 minutes, the mixture should reach a consistency you prefer. Remove from heat or it will continue to thicken. If gets too thick, add water 1 tablespoon at a time. If you don't have fresh herbs, leave out the rosemary and add 1/2 to 1 tsp dried thyme. It looks delicious – and thanks for sharing . it’s a Summer favorite for sure !.